1.Visit charity shops, reuse centres or junk shops to find sheet music, old maps, comics, unused rolls of wallpaper and last years calendars which can all be used as wrapping paper. If you are a freecycler see what’s available from fellow members. 2. 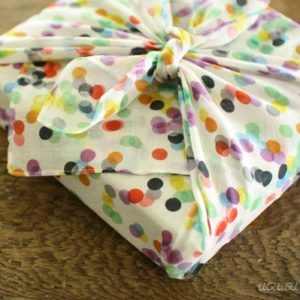 Make your own reusable gift bags. Here are some simple instructions on how to make a gift bag from an envelope. 3. You can also make gift boxes from waste card or last years Christmas cards. Use this simple cube template to get you started. 3. Discover the Japanese art of Furoshiki which uses fabrics and materials to wrap your presents. See a demonstration here. You can use material off cuts, old clothes, table cloths or scarves to elegantly wrap your gifts. 4. Plain brown paper can be recycled so makes a great alternative to shop bought Christmas paper. 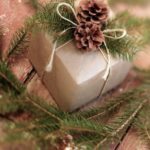 If you’re feeling crafty you can use stamps to decorate it or simply adorn with evergreen and pine cones to make it look festive.